This Easy Dark Chocolate Nut Bark Recipe will quickly become one of your favorite homemade treats. 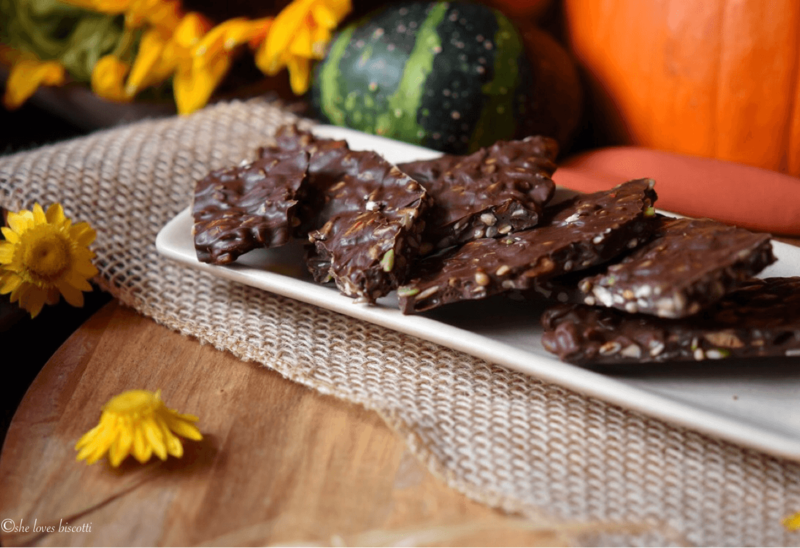 Roasted almonds, pumpkin and sunflower seeds, all enveloped in dark chocolate – a very nutty, very chocolaty treat that is so simple to make. Have you ever tried to buy dark chocolate with nuts? It can get a little pricey. I can understand that you pay for the quality of the ingredients. However, once you realize how truly simple and quick it is to make your own homemade nut bark, with quality ingredients, I assure you, you will never buy commercial again. The versatility of the ingredients used to make any homemade chocolate bark is what I find so practical about this recipe, as long as you respect the proportions there are infinite variations that can be made. For example, at Christmas, why not use some fresh pomegranate seeds (since they are in season); for Valentine’s Day, some goji berries (I talk about these berries in this recipe for Goji Berry Almond Date Energy Bites). In fact it is this versatility that makes this Easy Dark Chocolate Nut Bark Recipe a great year-round hostess gift – make it whenever you like, and modify it to suit the time of year. 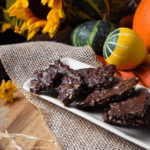 Since it’s fall right now, we will include pumpkin and sunflower seeds in this particular fall version of the bark. If you are lucky enough to grow your own sunflowers and still have access to the seeds, you will need to roast about 3/4 of a cup for this recipe. We will also need to roast about 1 cup of almonds and 1/2 cup of pumpkin seeds before adding to the dark chocolate. Please note that the specific measurements have only been provided as a guideline. Feel free to vary the type and amount of nuts and/or seeds. As far as the ratio is concerned, once again, adjust to your own personnel preference. I love a nutty chocolate bark so I use lots of nuts and seeds. Once the nuts have been roasted, it is time to melt the chocolate. I almost forgot to mention that you need to give the almonds a quick chop. Break the dark chocolate into little pieces and place in a heatproof bowl. Place the bowl over a pot of simmering water. Make sure the bottom of the bowl does not touch the water. When chocolate is almost completely melted, remove from heat and stir to finish melting. Stir in the nuts and spread evenly on a parchment lined baking sheet to about 1/4 – 1/2 inch thick. 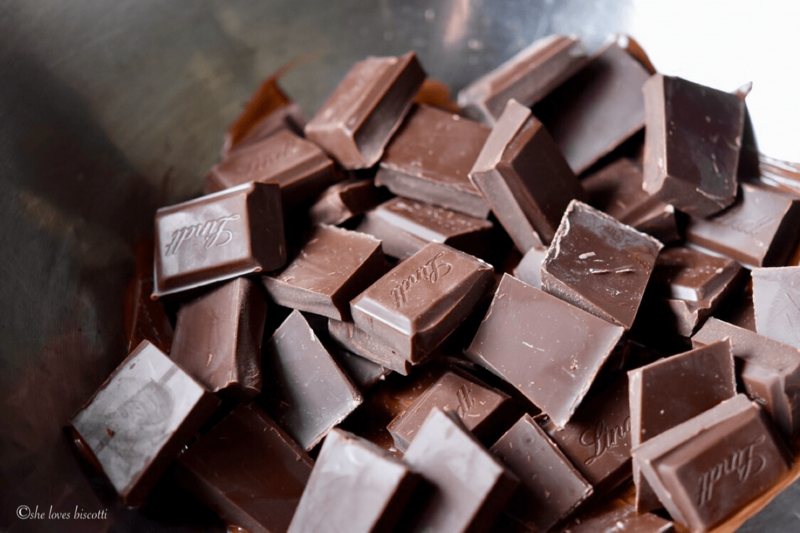 Nutrition tip: Did you know that dark chocolate, in particular, is a great source of antioxidants? But not all dark chocolates were created equally. In order to get all the benefits, choose dark chocolate that has at least 70% cacao solids. When looking at the list of ingredients, it should be the first one labelled. Cacao is the ingredient which contains the flavonols (those are the all-important anti-oxidants). As far as the amount you should be eating, limit yourself to 1-2 squares per day – more is not better. And remember, don’t gulp a glass of milk at the same time, as studies have shown that milk interferes with the absorption of the anti-oxidants. And always share your squares! 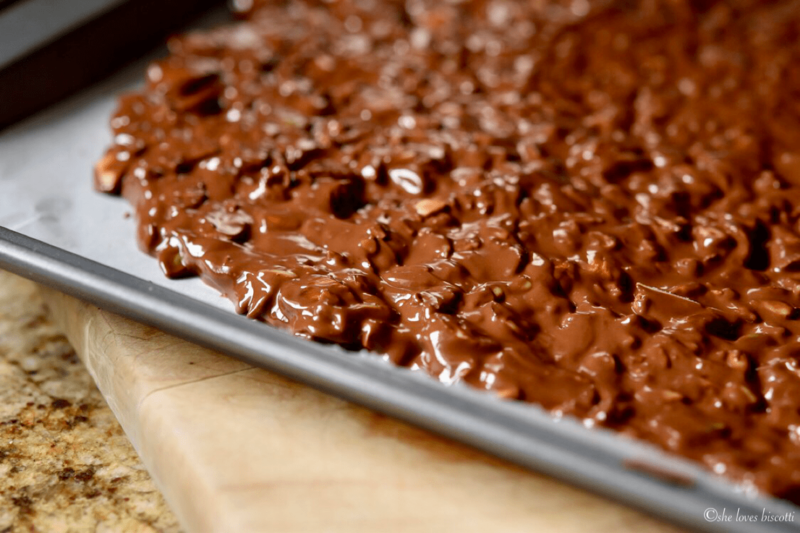 Place the chocolate bark in the fridge for about 10 minutes and then break it into pieces. 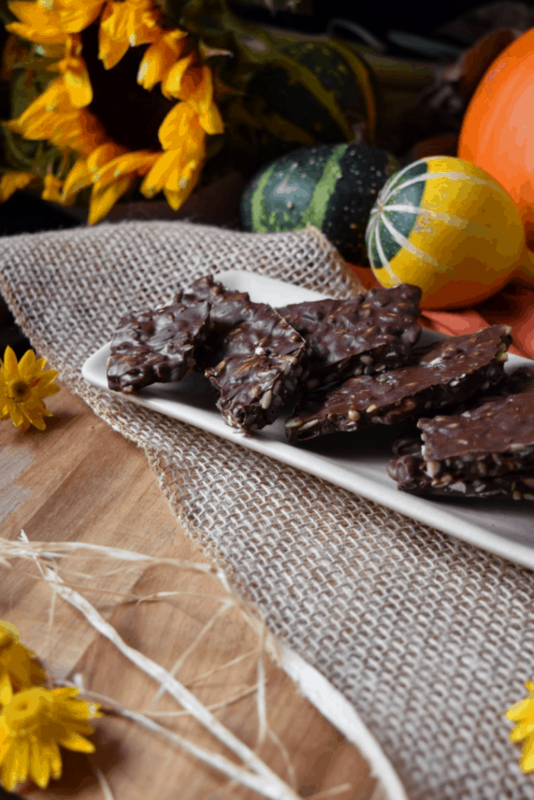 …and just like that you have made this wonderful Easy Dark Chocolate Nut Bark Recipe! A couple of years ago, I had the brilliant idea of planting sunflowers all along my back yard fence. Can you guess what happened to my beautiful sunflowers in the fall? Well, do you remember the movie Field of Dreams with Kevin Costner? Instead of baseball heroes coming to visit, we had squirrels… about a half dozen or so. I first started making chocolate bark when I found a recipe by Bonnie Stern in the food section of the National Post. Today, variations of this recipe can be found everywhere. This recipe comes together in under 30 minutes and rarely lasts more that one week in my household. It can easily be stored for up to ten days in an airtight container in the fridge. This Dark Chocolate Nut Bark Recipe will quickly become one of your favorites! ★★★★★ If you have made this dark chocolate bark recipe, I would love to hear about it in the comments below and be sure to rate the recipe! 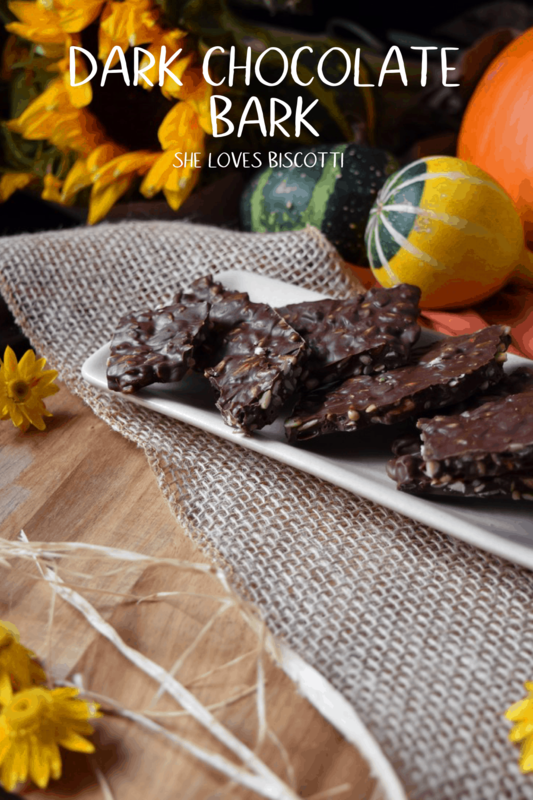 Here is an Easy Dark Chocolate Nut Bark Recipe that will quickly become your very nutty, very chocolaty special simple treat. Line a standard baking sheet with parchment paper. Set aside. Combine the toasted nuts with the melted chocolate. Spread out mixture on the parchment paper to about 1/4 inch thick. Refrigerate for about 10 minutes or until set. Break or cut into chunks. IF YOU ENJOYED THIS DARK CHOCOLATE NUT BARK RECIPE, SAVE IT FOR LATER. PIN IT TO YOUR CANDY BOARD! A nice addition to the holiday cookie tray and may I say a terrific job of tempering the chocolate. Even my mom and dad in Italy have a piece of dark chocolate every day, as well as 3-4 almonds. Moms know what’s good for you 😉 . I am a big fan of dark chocolate myself (at least 70 % cocoa, like you said) and I would love to make this bark since I’ve never made a bark before. Love the adds-on and the possibility to vary them according to the season. Another great recipe, Maria! I love the combination of nuts and seeds you’ve used here… such a fun way to give chocolate bark a fall-themed spin! Quelle bonne idée pour des cadeaux d’hôtesses, avec le Temps des Fêtes qui arrive à grands pas. J’ai hâte d’essayer cette belle recette et de la partager avec tous les miens. Maria, I do love a good chocolate bark and your ideas for swapping out different ingredients is great. I’m always wondering what to bring a hostess when I’m invited over and homemade gifts are always appreciated. Thanks for sharing this one! Great recipe to make for the holidays. Love your gorgeous pictures of this scrumptious looking bark filled with nuts and seeds. A great treat idea! What a good idea! Fall bark:) everyone does christmas bark with candy canes etc, but i’ve never been a fan of those…this is almost like a homemade chocolate bar! Oh Maria! You are a girl after my own heart! I love chocolate bark but everyone in my family makes it with milk chocolate. Sigh. We need dark chocolate! And lots of seed and nuts. To make it even more delicious you used Lindt chocolate by your photos so now I am drooling over the thought of it! I absolutely love chocolate bark of any kind. T his is so good and I bet it would make for a great Christmas treat. I like the idea of adding pomegranate seeds as well!